The Frontier boasts free space throughout the first floor for community members needing meeting space, areas for events or just a place to drop in and charge up. RESEARCH TRIANGLE PARK, NC – Today the Research Triangle Park officially opened the doors to its first project at the Park Center development, located at 800 Park Offices Drive. Called The Frontier, the space is a convening place for members of the RTP, Triangle and North Carolina communities that has free space, along with competitive lease rates for private offices, throughout the 142,000 square foot building. “This is a significant step for RTP,” says Mason Ailstock, Vice President of Business Development for the Research Triangle Foundation of NC, the not for profit that serves as the steward of RTP. “Just a year ago we announced the purchase of this property, and today we’re unveiling a completely new kind of space that has tremendous opportunities for not only the 200 companies located in RTP, but our universities and all of our valuable communities located across North Carolina,” he says. The goal of The Frontier is to be a location for testing ideas, and a key to helping users achieve this is by creating a space that is flexible in nature. 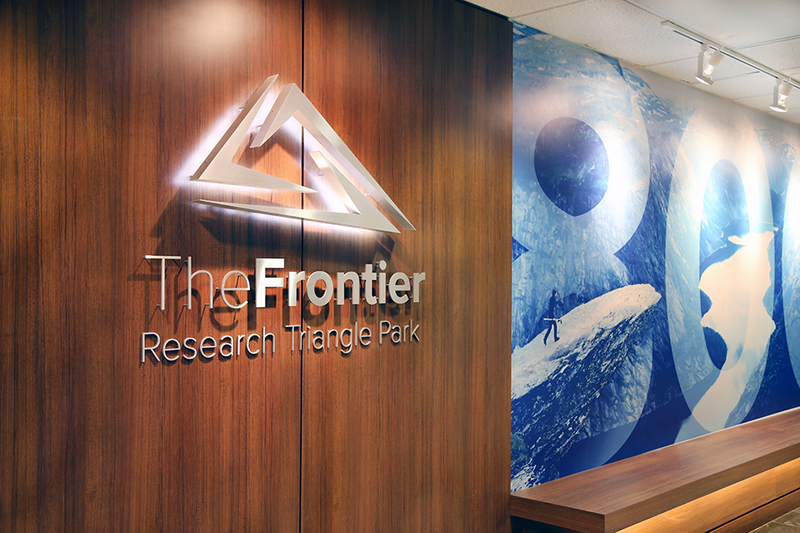 With branding and design direction from Provost Studios, The Frontier has inspirational imagery located throughout the building to encourage all who enter to push the limits. Provost Studios also designed the space plan in such a way that it could be utilized by the community based on their needs. Nearly all the fixtures on the first floor of the building are mobile, and can be adjusted to create different environments. Groups looking to hold meetings in The Frontier will have the opportunity to collaborate with two full-time RTP staff members assigned to develop The Frontier. Anna Rhyne is the Programs Manager for the space, and will work with community members interested in hosting events or other activities. Jacob Newbauer is the Community Coordinator, and will focus his efforts on developing programmatic offerings at The Frontier and making sure tenants have their needs met. The pair was also responsible for the majority of work required to get the space open and running. Opening The Frontier is the first announcement in what promises to be a year of continued progress for RTP at the Park Center site. Collaboration with partners EE&K/Perkins Eastman, Hines, Duda Paine, Hargreaves Associates and Gensler will push forward the physical development of the 100-acre site. Infrastructure and design plans will soon be finalized on the first phase of development. Currently, this phase is slated to include approximately 200,000-square-feet of retail, 250 multifamily residential units, additional office space, a full service hotel and designated space for collaborations between universities and industry. The Research Triangle Foundation of North Carolina serves the Research Triangle Park, a bellwether institution that was once referred to by Governor Luther Hodges as the “heart and hope of North Carolina.” Situated centrally among Duke University, North Carolina State University and the University of North Carolina at Chapel Hill, RTP contains 7,000 acres, 40,000+ employees, and over 190 companies, including Avaya, Cisco, Credit Suisse, IBM, NetApp, RTI International and Syngenta. RTP is also home to The Lab, an affordable incubation space for entrepreneurs and startups. Located in heart of RTP’s Park Center development, The Frontier is an open collaboration destination that can be used by anyone in the community for a variety of reasons. It’s connected to lightning fast internet, has free Counter Culture coffee for all visitors and plays host to weekly events sponsored by The Research Triangle Park. There’s never any shortage of activity, and we want the community to use the space as if it were their very own. Find out more at rtp.org/thefrontier.